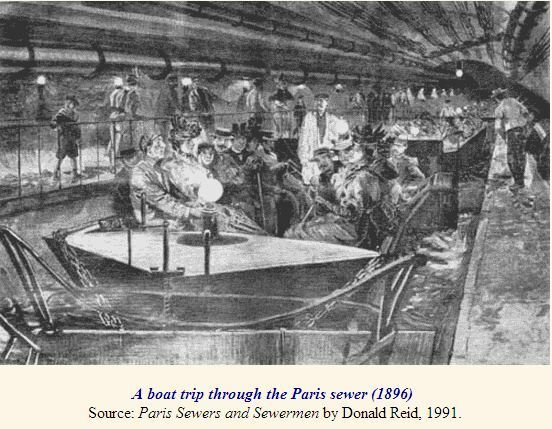 The Guide to Gay Paree 1869 – Part 8: Beware! Beware of the flower girls at the bals publics, cafés chantants, and outside the theatres, as well as the wily advances of well-dressed and spoken women. The uncouth boldness of the street-walker will strike the visitor with immediate amazement and distaste: but how could one expect that under a lady-like appearance and language the Parisian gay woman hides the evil designs of a fallen angel, and laughs inwardly at the gullibility of her victims? In markets barter is the rule: let an inexperienced lady make her appearance, and she will at once be asked the double the price that would be expected from an obviously sharp-witted French cook. There are no fishmongers in Paris: all fish are sold at the market. Jews selling lorgnettes, plated jewellery &c., who may also offer you licentious, forbidden literature and illustrations. The concierge, or caretaker of apartment buildings. This person, if offended, has it in his or her power to give much annoyance, mislaying letters, misinforming callers, and speaking ill of you to tradespeople. It is desirable to avoid the free discussion of politics. The police are ubiquitous and zealous, with wide powers of arrest and detention. The wiser course must certainly be to express yourself with great temperance in referring to the Emperor and government of France, and not to do or say anything that may serve to lessen the entente cordiale at present existing between our nations. This concludes the The Guide series. I hope you have enjoyed the trip to the Second Empire Paris. Let me know! Paris, the City of Light, is a veritable charivari of pleasures after nightfall; the visitor must only beware of not regretting the effects of a too-eager readiness to yield to the siren calls of its temptations and intoxications. The Grand Opéra, rue Pelletier. Properly the French Opera, run up in a hurry in 1821(to replace a building in the rue de Richelieu, at the door of which the Duc de Berri was stabbed and which was pulled down in consequence). In front of the portico, three dastardly Italians tried to assassinate the Emperor and the Empress in 1858, and now this building is being replaced too, by a splendid edifice designed by M. Garnier, due to open in 1871. The government provides 900,000 francs of annual subsidy. Peformances on Monday, Wednesday, Friday, and often Sunday. The Opéra Comique, Place des Italiens. In this handsome hall are presented lighter works, by modern composers such as Aber, Halévy, etc. The Théâtre Italien, Place Boildieu. Here a select audience listens to Italian Opera, in a season which lasts from November to April (after which the singers generally repair to London). The Théâtre Français, rue Richelieu. The seat of the French regular drama – classic works and modern alike, with a government subsidy of 240,000 francs. Molière was once its manager; in later years it has been the scene of triumphs of Talma and Rachel. The manager is allowed to withdraw an actor from any other theatre to the Comédie-Française (as it is also known) on one year notice. The Odéon, near the Luxembourg. A minor Théâtre Français, but not an inferior one. Here Beaumarchais’ play Le Mariage de Figaro was first produced in 1784; nine years later, the entire troop of actors was arrested by order of the Revolutionary tribunal. It has several times been burnt down. Théâtre des Variétés, Boulevard Montmartre. A neat and much-frequented house, in which the amusing musical vaudevilles of M. Offenbach can be seen. The infamous Boulevard du Temple, or ‘Boulevard du Crime’, on which the smaller theatres played the most lurid and distasteful melodrama, has now been destroyed to make way for the regime’s march of progress. The Théâtre Gymnase-Dramatique, Boulevard Bonne Nouvelle, is respectable. The plays are moral and the performers are all married. 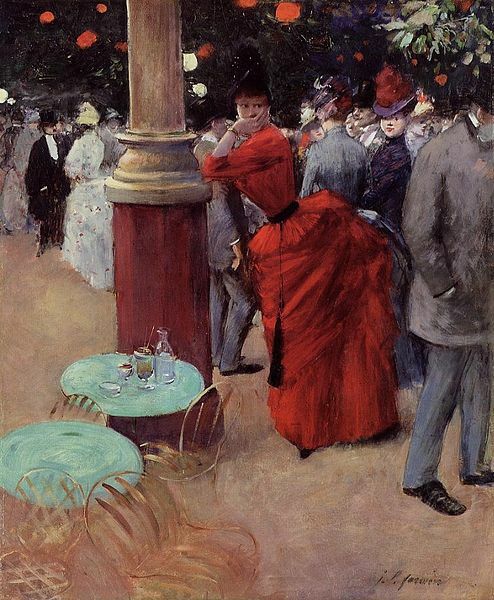 Note Ladies do not patronize the pit, or parterre, of any theatre; gentlemen admitted here should in the interval ensure their places by tying a handkerchief around the banquette. Be also warned that at the Grand Opéra, the claque sit here. This disagreeable cohort, paid by the management in this and other theatres to respond favourably to the entertainment in question, should on no account be shushed or silenced in their mercenary activities. An attempt to abolish the claques in 1853 proved totally unsuccessful after a fortnight. Tickets for all Parisian theatrical performances may be booked from a central office on the Boulevard des Italiens; avoid the profiteers who swarm outside the more popular theatres – their offers are always excessive in price, and frequently entirely bogus! Cafés chantants. 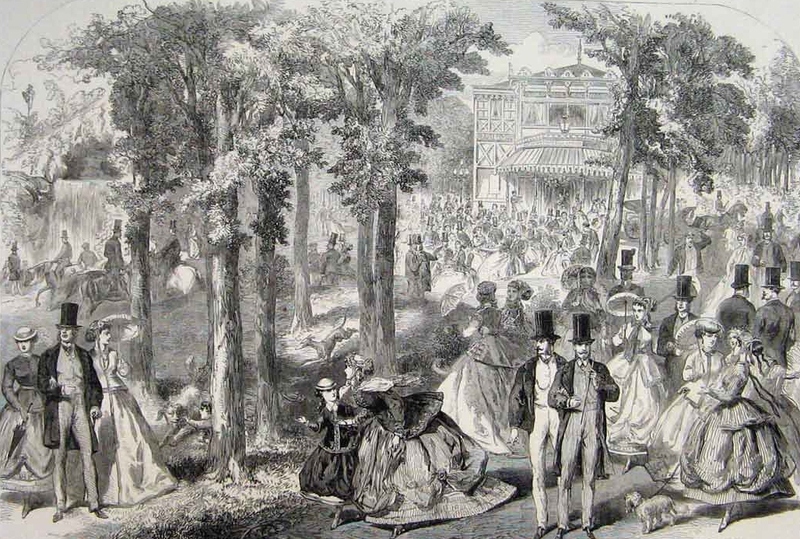 Spectators sit and listen to music, sometimes of a coarse nature, executed by performers often outrageously overdressed. No charge is made for admission, but one will be expected to take refreshment, usually of inferior quality. The company is not aristocratic, but the visitor need not fear annoyance or impropriety. The most celebrated of these institutions is L’Alcazar, rue du Faubourg Poissonière. Here the fabulous Theresa, whose salary exceeds 20,000 fr. per annum, sings, twice a week in the winter season, ditties of a satirical and even saucy turn. Balls publics. It is difficult to imagine scenes more curious or fantastic than those presented by these public dancing halls. 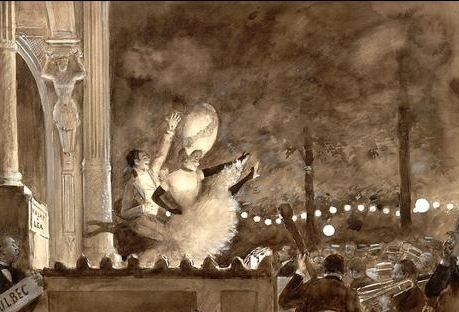 At the most refined level, balls masqués are presented during the winter in the Grand Opéra – the pit being boarded over and joined to the stage. Gentlemen may be admitted (10 fr.) in plain evening clothes, but ladies should be masked or in costume. The gorgeous and glittering revelry of the polka, waltz, and mazurka reaches its climax at 1 a.m. Strict etiquette is by no means the predominating characteristic of the fair who resort to this pleasantest of pandemonia. 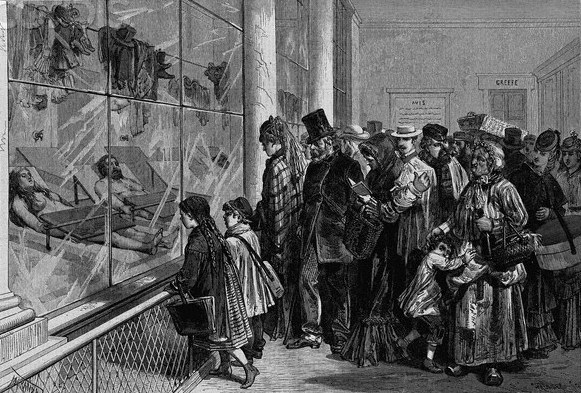 It will be conceived that if a visitor should take the ladies of his family to witness this display, he must take them to a box as a mere spectators, for to mingle with any of these too vivacious groups, could be worse than indiscretion. Elsewhere public dancing halls abound. Some of the smaller establishments in the suburbs are little more than dens of all the vices: official efforts to curb their activities and proliferation have not been altogether effective. In the centre of the city, more commodious establishments may be found, among them the Salle Valentino, rue S. Honoré. The architecture is a medley of the Moorish and Greek; the columns are gaily painted, and the recess is backed by mirrors which greatly enhances the brilliancy of the scene. There are a billiard table, a shooting gallery, a dynamometer for amateurs of muscular strength, and tables where trifles may be raffled for. The visitor must expect to see every variety of embrace not excepting the ursine hug. Admission 2-3 fr. Jardin Mabille, Avenue Montaigne. A large circular space, with a pavilion for the orchestra in the centre, is reserved for the dancers, and lighted by a profusion of gas-lights suspended from artificial palm trees. A snug corner is laid out for refreshment; here the votary of Terpsichore may treat his partner to a refreshing lemonade. An immense covered saloon affords the visitor a secure asylum from bad weather. The company of this elegant garden comes under the description of ‘the gayest of the gay’, but licence is not carried beyond propriety. Admission 2 fr. Would that the same could be said of the Salon de Wauxhall, rue de la Douane, which partakes of the character of the manufacturing arrondissement surrounding it, and is not much more respectably attended than the Holborn Casino! The police make forays on its bacchic excesses, and arrests are made. 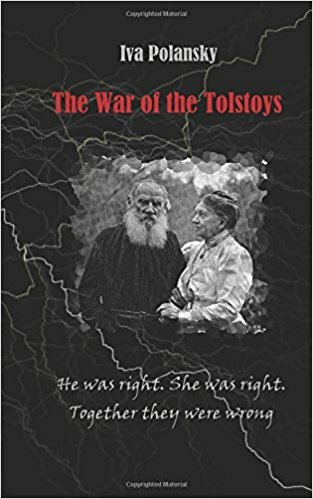 A novel and hilarious diversion is provided by an American importation. In the Roller Skating Club, rue Jean Goujon, skating on shoes soled with rubberized wheels is demonstrated daily by ‘Professor’ Fuller, a master of the Art who claims to have been ‘decorated by every Sovereign in the world with ice in his dominions’. The first of such institutions in Europe. The visitor should note that Paris is the most expensive city in Europe. English sovereigns and half-sovereigns are generally accepted in lieu of native currency. Much to be marveled at are the grands magasins or magasins de nouveautés, huge emporia divided into several floors and departments. These stores offer a wide range of dry goods, drapery, haberdashery, clothing, and furnishing. They are rigorously managed and quite respectable. Among smaller shops, American citizens may like to note the pharmacist Swann, rue Castiglione, by appointment to the American Embassy and the American Cracker Manufactory, Boulevard Malesherbes. 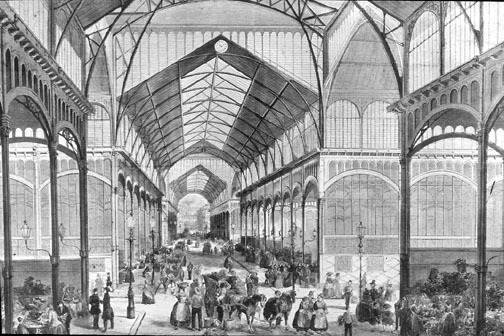 Novel gifts ‘for the folk back home’ may be found at the establishment of M. Paul Morin, Boulevard Poissonière, whose jewellery is forged in that wonderful new metal, aluminium, which so impressed the Emperor at the recent International Exhibition that he commanded a dinner service made of the same. The Maison Violet, newly opened on the rue Scribe, occupies a vast insular salon, ornamented with frescoes and a superb chandelier of one hundred jets. The tone is essentially aristocratic. Inner boudoirs sell the paraphernalia of the toilette, notably the house’s own exclusive ‘Reine des Abeilles’, or Queen Bee, cosmetic preparations, by appointment to the Empress. Le Train Bleu restaurant, Paris. Typical 2nd Empire interior design. Dinner is served between 4.30 and 8 p.m. Very large portions are the rule, and the visitor will find that one French appetite is sufficient for two Anglo-Saxon appetites. The carte: nothing can be more bewildering to the stranger than to have this printed list, of some hundred dishes, placed in his hand, and he soon begins to feel uncomfortable at the contempt that his ignorance must inspire in the waiter. We, therefore, recommend – for reasons of as much economy as of personal dignity – that the visitor favours the fixed price menu of the day, available at all but the very smartest establishments. For those who do not wish to risk the possibility of digestive contretemps, plain, wholesome English fare is offered by Lucas, in the rue Madeleine (ham or roast beef, with boiled cabbage and mashed potatoes, 1 fr. 20 c. English cheeses; half portions available); also by the well-established Byron’s Tavern, rue Favart, Taverne Britannique, rue Richelieu, and His Lordship’s Larder, rue Royale. Beware signs in windows advertising ‘Veritable Warranted Cheddar’ or ‘Stakes from London, Day and Night’. The stranger should not as a rule venture below third class, but he may safely patronize a new form of eating house, the cremerie or bouillon, in which simple dishes and collations are constantly ready for instant purchase and consumption. These places do not minister to the refinement or romance of dining out in Paris; no ceremony beyond eating and paying is attached to them; but they do have the advantage of the utmost convenience. 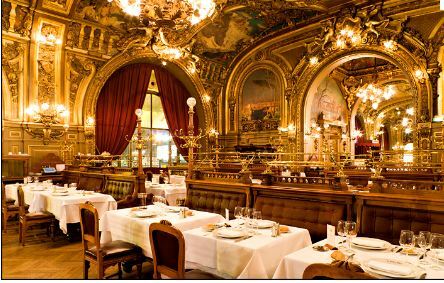 For those who wish to sample the full glory of Parisian cuisine, with expense no object, we would single out Café des Anglais, Boulevard des Italiens. Obtaining a table is not easy; there are times when those without réclame or a title seem to be tacitly excluded. 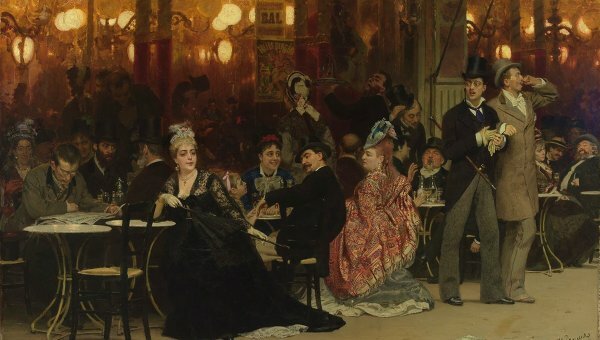 The restaurant upstairs (in which smoking is not permitted) has long been the haunt of la jeunesse aristocratique – the Duc de Rivoli, Prince Paul Demidoff, the Marquis de Modena &c. A beefsteak costs 1 fr. 75c. The cellars, which contain over 200,000 bottles of wine, including some of the Château Lafitte dating from the previous century, make a faery dining hall. The ground-floor café is but plain and typique, and open all night. Beware cocottes. Véfour, Galerie Valois. Salmon mayonnaise (the receipt a closely guarded secret), 2fr. 50c. The 36-page menu here lists twenty hors d’oeuvres, thirty-three soups, forty-six dishes of beef, thirty-four of game, as well as forty-seven of vegetables and seventy-one fruits en compote. Trois Frères Provençaux, Galerie Beaujolais (not to be confused with its pallid imitator, the Deux Frères Provençaux, rue Dauphine), has four salons and eighteen private rooms; fine wine, cod with garlic a speciality. Note Ordinary red table wine is usually drunk mixed with aerated water – this precaution is especially recommended in inferior restaurants. Paris boasts at least twenty thousand cafés. The more salubrious of them present the visitor with a sprightly scene. Around are luxurious couches for your accommodation; mirrors, gilding, and tasteful adornments of decorative skill enrich the walls; whilst every art that can be used to attract and retain the visitor is brought into operation – the daily journals, draughts, chess, dominoes, cribbage, and billiards. Excellent coffee, chocolate, and liqueurs are supplied at reasonable prices. Ladies are at perfect liberty to frequent these saloons and are numerously found there. The utmost decorum prevails, and the freedom and ease of conversation carried on in a low tone, form an additional attraction to these popular places of resort. Smoking is generally prohibited until the evening. Grand Hôtel, Boulevard des Capucines. 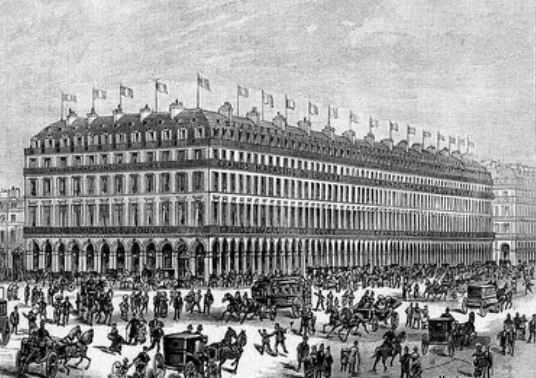 A new hotel, financed by the Jewish bankers Pereire, of great show and size (not to be confused with its neighboring rival, the Grand Hotel du Louvre against which it has been wrangling a costly and bitter legal suit). Seven hundred rooms, for which one can expect to pay 20 francs per diem. For all the splendour of its public quarters, designed by M. Charles Garnier, do not recon on quiet, prompt attendance. There are few private w.c.s and many damp, dark corridors. More commodious to traveling agents for commercial houses than families seeking cheer and respectability. A lifting machine, operated by hydraulic press, raises clients to their floor, thus circumventing the fatigue of staircases. Electric bells operate throughout. 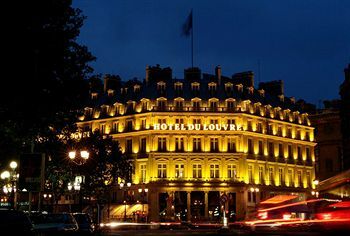 Hôtel Meurice, rue de Rivoli. Much patronized by visiting royalty and aristocracy. Our intelligence has it, however, that standards in this establishment have fallen since it passed out of private hands and into those of a joint stock enterprise, the Paris Hotel Company. Hôtel de Calais, rue Neuve des Capucines. Frequented by the elite of American society. American breakfasts served (buckwheat cakes, fishballs &c.). Close to the American banking house. Visitors intending to stay for longer periods should not hesitate to take a furnished apartment: a reliable agent can be found in A. Webb, 220 rue de Rivoli, tea dealer and wine and brandy merchant. Many English, Americans, and Russians of more than moderate means prefer the leafy residential stretch of the Champs Elysées. 1804 Napoleon Bonaparte proclaimed Emperor. 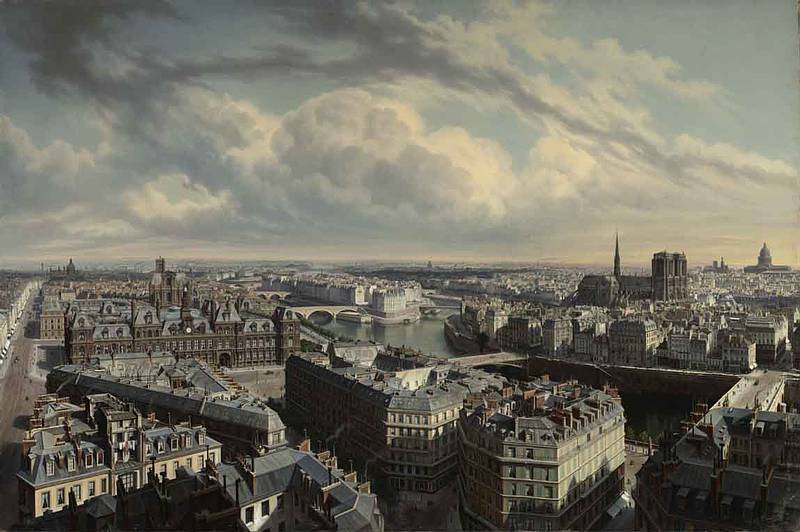 At the outbreak of the Revolution in 1789, one-third of Paris had been occupied by ecclesiastical property. Since much of it was subsequently expropriated, and then sold to speculators or retained by the state, Napoleon availed himself of an opportunity to beautify the city, opening the rue de Rivoli, completing the Louvre Palace, and beginning the Arch of the Etoile. 1814 Abdication of the Emperor. Restoration of the Bourbon Louis XVIII. 1830 Three-day revolution. Louis-Philippe, Duke of Orleans, proclaimed King. He completed the Arch of the Etoile, the Madeleine, enlarged the Hôtel de Ville, and repaired many neglected monuments, as well as widening principal thoroughfares. During this reign, Paris was surrounded with the present fortified wall and ditch, and the detached forts erected. 1848 February revolution. After two days’ fighting, Louis Philippe fled, and republic was proclaimed. The words ‘Liberté, Egalité, et Fraternité’ met the visitor’s eyes in every direction; they have now been erased. Louis Napoleon, son of Louis Bonaparte, King of Holland and nephew of the first Napoleon, elected by universal suffrage President of the French Republic. 1851 2 December. Discretion compels us to pass over the coup d’état which took place on this date. Suffice it to say that exactly a year later, Louis Napoleon was elected Emperor by universal suffrage, and the present regime, known as the Second Empire was established. In 1853 Louis Napoleon married the present Empress, Eugénie de Montijo. Since these events, works of public utility in Paris have proceeded at a pace quite stupendous, throwing into shade everything previously achieved in any city of the world. Picturesque but insalubrious quarters of narrow and crooked streets have been cleared, the boulevards extended, railways constructed. Today visitor to Paris will find a population between one and a half and two million. In 1860 the line of fortified walls which surrounds the city was made the municipal boundary; this wall is rather more than 22 miles in circuit and has 66 entrances or gates. The city is divided into 20 arrondissements, with their own administrations, over which are placed the Prefect of the Seine, Baron Georges Haussmann, and his municipal council. The modern fashionable quarter comprehends the bright and brilliant rue de Rivoli, Place Vendôme, Boulevard des Italiens and the Champs Elysées. The Palace of the Tuileries is the Paris residence of the Emperor and Empress; on the Ile de la Cité are the law courts, central police office, and the great hospital; there is nothing like ‘the City’ in London – the Bourse or Stock Exchange being close to the fashionable quarter. In the Faubourg Saint-Germain, on the Left Bank of the river Seine, stand the vast hotels of the nobility, in which some of the traditions of old French society are maintained; in the adjoining Latin Quarter, many thousands of students lead a life of riot and license hardly to be understood by a foreigner. To the East, in the Faubourg S. Antoine, are numerous manufactories and the dwellings of those who work in them, formerly the hotbed of terror and insurrection. On the outskirts, as in the Faubourg S. Victor, Mouffetard, Belleville &c, are to be found the most wretched of the population; but Paris may at least be proud that it possesses fewer dens of misery, filth, and vice than the vicinity of Tottenham Court Road or Drury Lane can exhibit.